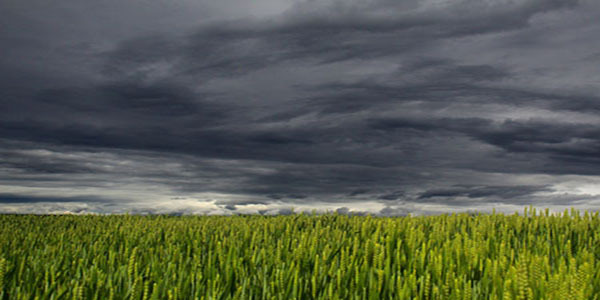 The first week was rather unassuming, as a quiet pattern ending July lingered into August. Things got more interesting, however, as we approached the second week. Ironically, however, the month's first twister occurred on August 9th on a day which actually did not feature severe weather. It was no ordinary tornado but instead was determined to be a landspout, which is a tornado that forms along the ground as opposed to within the cloud. This rare phenomenon occurred along a lake breeze boundary which is a common occurrence in Chicagoland during the warm season. While landspouts can still can produce damage like other tornadoes, this one luckily did not, and only produced fascination for onlookers on the ground! The 15th of the month, however, brought the Midwest’s first impactful tornadoes of the month. Damage resulted near and north of Indianapolis, IN, especially in Brownsburg where reports of uprooted trees emerged. The active weather did not stop here, as thunderstorms two days later spawned another twister just to the east of Cincinnati, OH in Sardinia, OH on the 17th. A more potent cold front swept through the Ohio Valley on the 21st, producing additional tornado touchdowns just to the north of the cities of Dayton and Columbus in Ohio and also led to various crop and structural damage in west central portions of the Buckeye State. The highlight of August occurred on the 24th when a potent storm system swept out of the Northern Plains and into the Corn Belt States. The associated frontal boundary led to the most significant outbreak of tornadoes of the month with a line of tornadoes touching down approximately from Crawfordsville, IN, northeast to Toledo, OH. 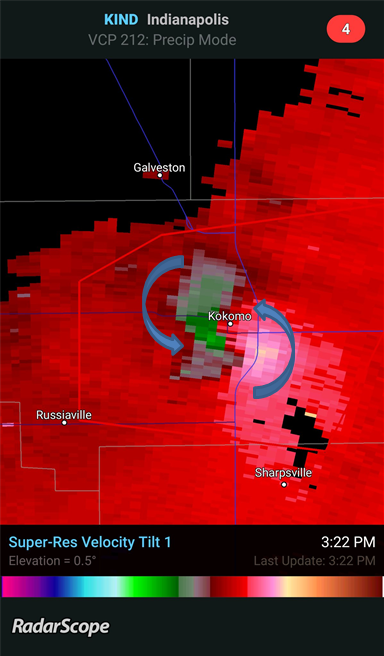 The city that received the biggest hit from this storm was Kokomo, IN, where a local strip mall collapsed. Thanks to quick action and diligence by a store manager, no injuries resulted as patrons took cover in time. Several more disturbances brought severe storms into the Ohio Valley to close out August with thunderstorm wind gusts 60 – 65 mph near Dayton, OH on the 27th and powerline and tree damage in Columbus, OH on the 28th. 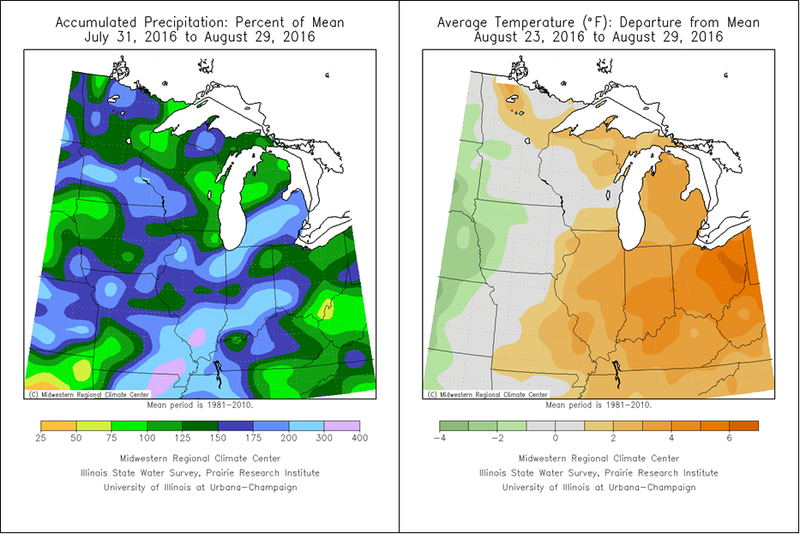 Due in large part of the more unsettled weather, the month was a soaker for the Midwest. If there was an area that was not at least average, it was certainly well above the mark. For the state of Illinois, is was the second wettest August on record while Indianapolis more than doubled its normal rainfall output. The city finished with its 4th wettest August of all-time mostly from several events that occurred throughout the month which was highlighted by a daily total of 1.82” on the 26th. Cincinnati, similarly to the Indiana capital, also finished close to 200% of normal in the rain gauge and 4th wettest August of all-time, featuring a daily record of rainfall of 1.79” on the 15th. In terms of temperatures, it was another very warm month for the Corn Belt states, in an otherwise hot summer across the United States. While record-breaking heat was held in check, the monthly average temperatures still finished 2 to 5 degrees above where an otherwise typical August usually finishes. Ohio warmed the most overall, anywhere from 4 degrees above the mark for the western half, to a scorching 6+ degrees toward the Pennsylvania border. Chicago was on the low end of the extreme, but still rounding out 1 to 3 degrees above average. Interesetingly, Rockford in northern Illinois never went above 90 degrees the whole month, compared to the 5 times that the max daily temperature broke the mark in 2015. Even though the heat missed Chicago and Rockford, the state of Illinois as a whole ended as the second warmest August on record.